Musandam Beach camping is an adventurous and enjoyabale tour package combined with full day dhow cruise. Natural and wild Dolphin watching, swimming and snorkeling and visiting historical Telegraph Island and Seebi Island exploring Musandam fjords, sightseeing and breath-taking sea so just start to Musandam beach camping and dhow cruise. On top of that you will have unlimited refreshments like lunch, BBQ dinner and breakfast. We are gping to offer a celebration in night with music, live BBQ, campfire, beach games and many more. So there will be comfortable sleeping and sitting arrangements, basic toilet and shower facility with water. So get ready for exciting Musandam beach camping combined with dhow cruise. Musandam camping trip is value doing, we assure, you will enjoy each moment of this trip. So it will be additional adventurous than spending a day on dhow cruise and night under full moonlight and star sky at camping ground. We have served thousands of happy customers in last years and we are ready to serve you as well. Enjoy the traditional Omani hospitality inside the Musandam fjords by dolphin watching, swimming and snorkeling and have a good time together with your friends and family. “It’s also an insane amount of fun and possibly the best way to make new friends or simply pay some excellent quality time with existing ones. 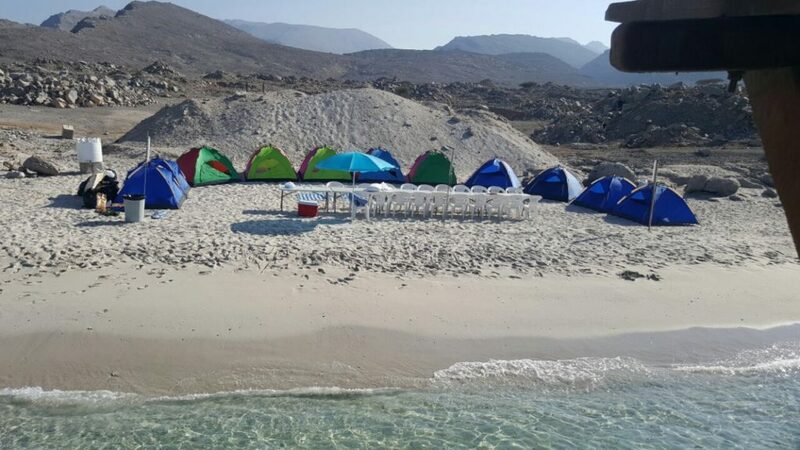 If you attending to visit Musandam, there are some amazing spots around both Khasab and Dibba for overnight camping. So from the Rocky Mountains to deserted beaches, the region’s diverse and rugged terrain ­provides some wonderful backdrops for ­setting up camp – whether you’re a novice or a camping professional. Sharing Dhow cruise with six hours in Musandam Fjords and Sightseeing. Natural and Wild dolphin watching, swimming and snorkeling and view of fisherman villages within Musandam fjords. Basic toilet and shower facility with water on boat will beach campsite. Snorkeling and swimming gears, life jackets, towels and comfortable sitting arrangements. There is two stop for swimming and snorkeling, first at Telegraph Island and Seebi Island the dhow will be anchors for 1 hour. View of fisherman villages like Nadifi, Qanah, Maqlab, Seeb and Sham only reachable by boat. An unforgettable Musandam beach camping stay with with dolphin watching, swimming and snorkeling in crystal clear water. Music, play cards, volley ball, badminton, campfire and kayaking on the campsite are provided. We will create a live BBQ on the the campsite if it is not too windy.